There are five different methods of interfacing with the Programmatic Interfaces of the OAS server, each targeted at a specific set of needs. 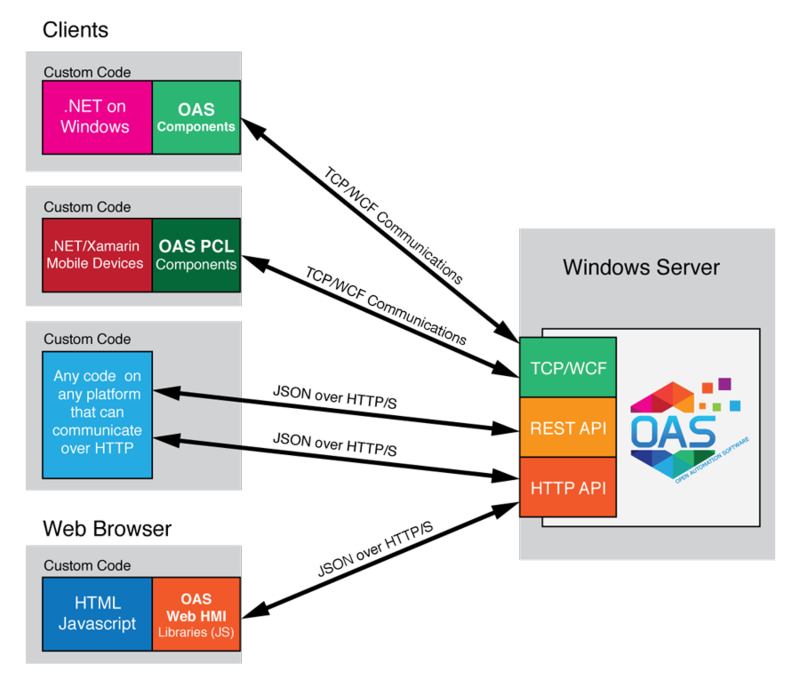 Create data sources for OAS with target to both .NET Standard 2.0 for cross platform deployment and .NET Framework 4.6 or greater and .NET Framework 4.0 to deploy Windows Services locally and remotely. Define your own properties that are automatically added to the OAS engine. See the UDI Technical Overview on how to create a Universal Driver. For .NET developers who wish to create HMIs or system automations on a windows platform, these components provide visual and programmatic access to real time and historical data, as well as interfaces into automated configuration of the OAS server. The OAS PCL (Portable Class Library) is a programmatic interface designed to be used in a Xamarin Application, which allows developers to compile native applications for iOS and Android devices with a single code base. Using standard REST patterns and JSON over HTTP, the REST API provides a programmatic interface for any platform that supports those technologies, including Linux servers, RaspberryPI and Arduino devices, and more. The following graphic shows how Open Automation Software provides programmatic access for real time and historical data and shows the protocols and tools to create specific applications.